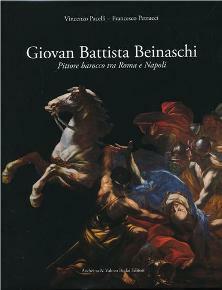 Italian publishing has again confirmed its vitality : a Baroque painter active in Rome and Naples in the second half of the 17th century, Giovanni Battista Beinaschi (Fossano (Cuneo), 1636 - Naples, 1688), relatively unknown to the general public - and not mentioned in the Larousse des peintres - is highlighted in a remarkable work, edited by Andreina and Valneo Budai Editori (July 2011). The authors, a Neopolitan art historian, Vincenzo Pacelli and the Roman, Francesco Petrucci have combined their talents to write a monograph accompanied by a catalogue raisonné of works. Seven historians, including Pietro Boccardo, Gianluca Forgione and Giuseppe Porzio have also contributed various chapters (critical legacy, catalogue entries,...). The layout is the usual one for this type of book : two chapters (100 pages each) on the artist’s activities in Rome and Naples, a study of criticism of the artist, and, finally, the catalogue raisonné (102 pages) ; several appendices : lost, rejected works, archival documents are all useful additions to this thorough publication. Let us try to find out in a few lines who Giovanni Battista Beinaschi was. Born in the Piemonte region of northern Italy, he studied as an artist under Esprit Grandjean. Early on, before 1652, he set out for Rome to continue his education. There he was a student of Pietro del Po (1610-1692). As recounted by Mariette (Abecedario, 1851, I, pp. 108-109) : "It is not sure that he was a disciple of Lanfranco, but it is nonetheless true that he was his follower and imitator who, wishing to walk too closely in the steps of this great painter too often exaggerated his aggressive manner. He concentrated on black, he overcharged his contours and although what he painted shows verve and genius, very little of what he did is pleasing...". Besides this decisive influence on his style, his artistic production also reveals his reflections on the lessons of the grand masters : Raphael, as well as Jules Romain, Annibale Carracci, Poussin and, above all, Pietro da Cortona. From 1664 to 1676, Beinaschi settled in Naples at a time when painting was undergoing a profound change and taking on, thanks to Mattia Preti but more notably Luca Giordano, the new Baroque tendencies thus replacing the Naturalist and Classical formulas which had prevailed during the first half of the century. Beinaschi, although less innovative than Giordano, produced many large Baroque decorations at this time for the churches in Naples, the frescoes illustrating the Story of Saint Nicolas de Bari at San Nicola alla Dogana in 1664 (now destroyed) and the Story of the Virgin at Santa Maria degli Angeli in Pizzofalcone around 1660-1670. These works reflect his fondness for swirling figures in an open space and skilful foreshortening. Lanfranco’s influence is obvious, and, through him, that of Correggio. In 1676, Beinaschi returned to Rome and executed the allegorical frescoes in the Saint Barnabe chapel at the church of San Carlo al Corso. He then settled permanently in Naples where he would execute one of his masterpieces : the Paradise of 1680 for the dome of the Santi Apostoli, a subject already treated by Lanfranco in 1641-1643 for the Chapel of the Tesoro in the Duomo. Beinaschi softened the lines of his figures and lightened his palette to achieve a more pictorial relief. He would go on to execute other commissions, notably at the Gesù Novo. But whereas Giordano had by then gained international fame, the public shunned Beinaschi’s forceful art condemning his name to almost instant oblivion . Francesco Petrucci’s chapter on Beinaschi between Rome and Naples is disappointing because of the page layouts : lesser paintings are reproduced in full-page color ; the painter of battle scenes is expedited in just a few lines and the important work from Nantes, Joshua’s Battle Against the Amalekites (ill. 1), is, in our opinion, not duly appreciated ; the last ten pages of Petrucci’s essay concern Naples : it is therefore redundant with the following essay by Pacelli on the Neapolitan period ; some of the essential works from the Roman period (the frescoes from the Roman churches, Santa Maria del Suffragio, Santi Ambrogio e Carlo al Corso) are reproduced much too farther on, in the chapter on critical legacy ; errors appear in the legends (p. 9) ; the figures in the comparisons are not always pertinent : figure 108 (Beinaschi, The Crowning of Thorns should have been accompanied by a Trevisani on the same theme and not a rather untypical Beinaschi (The Incredulity of Saint Thomas) as this one alludes more to Caravaggio and Guercino ; lastly, there appears to be a lack of coordination : a Crucifixion of Saint Peter attributed to Beinaschi (?) on p. 49 or by Beinaschi himself, n° B1, p. 271. However, Vincenzo Pacelli’s chapter ("Beinaschi et la décoration baroque à Naples", pp. 121-209), thanks to an exceptional photographic coverage - almost 90 color images - and a documented text, confers a rather extraordinary depth to the artist : this is the greatest of Lucas Giordano’s contemporaries, with a legacy which affected Angelo and more particularly Francesco Solimena and his students, as well as those of Lucas Giordano : Matteis, Farelli and Tommaso Fasano . The catalogue raisonné (pp. 231-346) is guilty of a serious error : the black and white photographs do not carry any legends. Thus, two paintings on the theme of the Two Trinities are analyzed on p. 272 (B2 and B3) ; which one is reproduced here ? After investigating, we determine it is B3 (from the Lemme coll.) . There are no cross references to the color photos and it takes a while to realize that the B3 in question is in fact reproduced in color on p. 103. Wisely, the authors have divided the works by type ; thus the catalogue raisonné presents sub-chapters : decorative cycles (p. 231), altar paintings (p. 271), collector or easel paintings (p. 293). Studies of male heads have been grouped together ; apparently there were quite a few : for the Head of an Apostle (Musée de Macerata ; n° 37, p. 309), there are two other, good quality, versions at the museums in Bordeaux and Caen. In concluding, we would voice two regrets : as was the case for Jacob Bean and Walter Witzthum who wrote a pioneering article on this artist’s drawings in 1961, we would have liked to see a specific chapter on Beinaschi the draughtsman, studied here in only five pages (pp. 37-42). For instance, we would like to draw readers’ attention to an important drawing held at the Musée du Louvre (ill. 2) : a look at volume II of Nicolas Poussin’s drawing oeuvre  would have allowed the authors to enrich the drawing works with a Jacob Discovering the Well where Laban’s Sheep Drink. 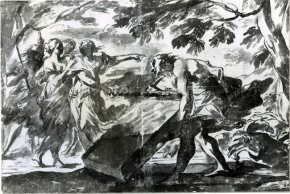 For a better idea of how many of Beinaschi’s paintings are yet to appear, we might just mention an important drawing by the artist, The Flood (Dusseldorf, Kunstmuseum), preparatory for a fresco (or an easel painting) which was not mentioned by his most faithful biographer, Bernardo de Dominici. French readers will also miss not seeing Mariette’s name included more often : his Abecedario devotes about thirty pages to Beinaschi (Vol. I, pp. 108-109). Even if Mariette remains critical of his art ("very little of what he did is pleasing... He was meant for grand projects and particularly for ceilings"), he provides important information for European readers and connoisseurs of the mid-18th century[[The RETIF database also provides much information which the authors did not always take into account : a Saint Francis (Compiègne, Musée Vivenel) ; a Moses Striking the Rock (Abbey of Sainte Marie du Mont des Cats, near Lille) ; The Hermit Saint (Musée de Lille), with another version at the Musée de Dijon ; Job Mocked by his Wife (Bastia, Church of Saint Jean Baptiste) ; a Pieta (Libourne) and a Saint Thomas de Villeneuve Distributing Alms (parish church in Formentin). Also, further research into Parisian sources would have uncovered various other works (we qualify this information by adding that these attributions have not been verified) : a painted study for an Abel or a Condemned (Tarantino Gallery, November 2008) ; paintings found in different churches : The Bronze Serpent, 135 x 185 cm, in the church of Chartrettes ; a Death of Joseph (close to a painting in a British collection, cat. B18) in the church of Notre-Dame de Saint Omer ; two paintings placed on deposit by the church of Le Saint-Sepulcre in Abbeville in the city’s museum, The Pilgrims at Emmaus and The Incredulity of Saint Thomas (260 x 200 cm) ; Striking the Rock at the Leegenhoek Gallery in 1966 and a Triumph of Bacchus (66 x 154 cm) on the art market (around 2000). Vincenzo Pacelli and Francesco Petrucci, Giovanni Battista Beinaschi, Pittore barocco tra Roma e Napoli, Andreina e Valneo Budai editori, 2011, 400 p., 160€. ISBN : 9789788890492. Seicento, le siècle de Caravage dans les collections françaises, Paris, 1988-1989, p. 128. We will express only one remark about the catalogue. There are two known versions of The Two Trinities (n° B1 and B2, p. 272) ; We personally find the quality of painting B2 (not reproduced here) highly superior to that of the one in the Lemme collection (B3). Pierre Rosenberg and Louis-Antoine Prat, Nicolas Poussin, 1594-1665. Catalogue raisonné des dessins, Milan, 1994, n° R846.